Fireforge Games has released their new Steppe Warriors box set over in their webshop. "The open steppe, a clear day, a swift horse under you and a falcon on your wrist to start up hares." This box enables you to build up to 24 Steppe Warriors on foot of the 12th13th century. 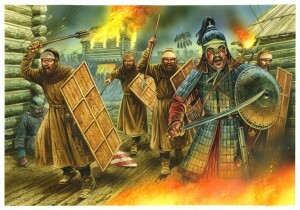 Several weapon options like spears, swords, axes, maces and bows are included. You'll be able to build up to 24 Foot Warriors, each one equipped with one hand weapons and shields or bows . Figures are supplied unpainted and require some assembly.